commissioning and supporting our robotic palletizing systems. Our culture values doing the right thing for our customers. Columbia/Okura LLC designs, integrates and commissions end of line robotic palletizing solutions for most major industries. 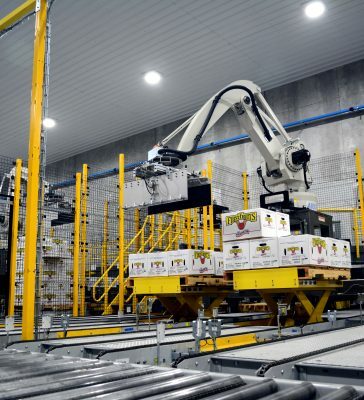 For over 20 years, Columbia/Okura has been a leading provider of robotic palletizing systems by delivering custom engineered solutions to meet demanding customer requirements. With over 800 robotic palletizers installed throughout North America and beyond, Columbia/Okura is unparalleled in the industry. Whatever your palletizing needs, we are confidence that we will fulfill them. Decades of industry leading experience and expertise have allowed us to put safe practices and operations at the forefront, enabling us to deliver the safest solutions in the industry. Our team draws on decades of palletizing expertise to deliver dynamic products and services that increase productivity and reduce production downtime. The sales and technical teams at Columbia/Okura are available for on-site consultations. By observing operations and listening to our customers needs and challenges, we are continually focused on optimizing palletizing processes to enhance throughput and reduce production costs. Our skilled engineers and technicians offer outstanding service and support from initial start-up throughout the equipment life-cycle, maximizing equipment efficiency. We work with our customers to ensure our solutions and training meet their production requirements. We are committed to continuous improvement in all areas of our business to ensure our customers expectations are met and exceeded. Columbia/Okura partners with industry leading OEM’s that position us to integrate complete palletizing system solutions that best suit our customers’ production requirements. Our team is skilled at listening to client needs and objectives to deliver innovative solutions. With hundreds of successful installations all over the world, we draw upon our years of experience and palletizing expertise for every project we touch. Thank you for your interest in working for Columbia/Okura LLC. 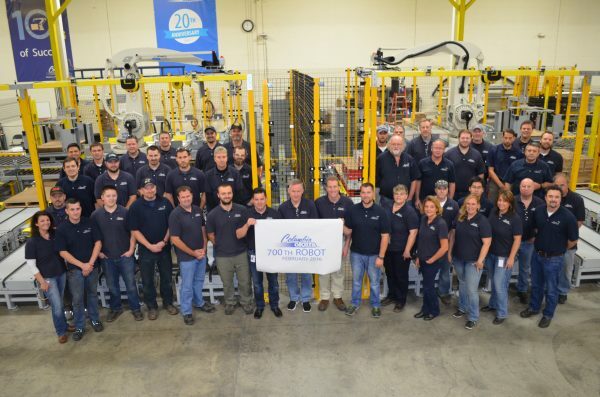 Columbia/Okura's knowledgeable and dedicated experts prove end-of-line packaging solutions that lower the overall cost of operation, enabling our customers to focus on other areas of their business. Solid partnerships with leaders in the palletizing industry expand our offerings to you. LET US BUILD A SYSTEM THAT FITS YOUR NEEDS. Send us your product, and we will prove we can stack it. With multi-line capabilities, our demo systems can handle any product.